Well, we don't have long to wait to see how Celtic will respond to that chastening defeat. The champions are back in action on Wednesday at home to Partick Thistle. As ever, BBC Scotland will provide radio and text coverage of that one, so join us if you can. Thanks for your company today and enjoy what remains of the weekend. I'm sure that won't be a problem for Hearts fans after such a fantastic victory. Quote Message: It has been an unbelievable run. There have been very few times when you can pick out a Celtic game and say they were absolutely poor. Today was one of those days, and the first one for a long, long time. That was not the real Celtic. Their midfield was out-gunned in the first half, they couldn't get a grip on the ball and they didn't enjoy the surface. But they will definitely come again. They don't want to be going into the winter break having people on their tail. It has been an unbelievable run. There have been very few times when you can pick out a Celtic game and say they were absolutely poor. Today was one of those days, and the first one for a long, long time. That was not the real Celtic. Their midfield was out-gunned in the first half, they couldn't get a grip on the ball and they didn't enjoy the surface. But they will definitely come again. They don't want to be going into the winter break having people on their tail. The man-of-the-match champagne went to Harry Cochrane, who fired in a fabulous opener at Tynecastle. But, at the tender age of 16, he's not allowed to drink the stuff, so it was handed over to team-mate David Milinkovic, who scored twice. "We got the result but we need to keep it going," the teenager told Sky Sports. "I can't get carried away, I just need to keep performing like I did today." Hearts fans will be glued to Sportscene later to check out the highlights. All of Saturday's top flight action will be included too, with 22 goals in total to enjoy and some touchline aggro at Hamilton. Join host Jonathan Sutherland and guests Steven Thompson and Michael Stewart on BBC 2 Scotland at 18:00 GMT. So, that was a first domestic defeat for Celtic in 585 days. It was also the first time Celtic haven't scored against Scottish opposition in 75 games. Hearts; take a bow. Craig Levein's side turned in a great performance, full of energy and aggression, to absolutely demolish the champions at Tynecastle. The scoreline is a surprise and Celtic had an off day but it was no fluke. "I must complement Celtic. To go this far without losing a match in the league or cups in Scotland is quite remarkable. I am probably even prouder of my players because we have managed to break that run. "They played honestly today. They did everything they could to run the miles they needed to to shut Celtic down. They put pressure on the ball and managed to unsettle Celtic as a team. All credit to the players. "They gave themselves, each other and the supporters absolutely everything they had. I was thrilled with the interaction between the players and supporters. You could hear the noise with the new stand, and it was hugely pleasing to hear that." Kenny O'Hara: "Well done to Hearts on annihilating the streak and well done to Celtic on the greatest streak we will get ever see in Scottish football." Douglas Bell: "As a Jambo, I'm absolutely delighted. But nobody can deny Celtic are a quality outfit. Just look at their record. But today, well, today it was OUR turn to get something." Dorian L'Grass: "No complaints. Better team won. That magnificent run has looked shaky for a while. Hearts were pumped right up and we were not equipped for it - a positively unrecognisable Celtic today with not a single player looking at it. A real lesson from Hearts in how to defend, too. Can't be too harsh on the Hoops and Brendan after the last couple of years. Craig Wright: "Erm, where on earth did that come from?!! Massive next game for the Dons at Parkhead!" DPGC: "Totally deserved on @JamTarts part they were the better team, it was coming @celticfc we’re poor, but taking nothing away from Hearts well deserved." If any Hearts fans are still pinching themselves, no, it wasn't a dream. The Jambos turned over Celtic in some style, with two great strikes from Harry Cochrane and Kyle Lafferty in the first half and a second-half double from David Milinkovic. "We hit the reset button and look to get three points in our next game. "Now that the run is finished. We want to get back to winning ways as quickly as possible." "I know the disappointment and the honesty of the group; it was just a case of saying remember what this feels like - that obviously hurts - but also to remind them that what they've done is incredible. "It's over now and we need to get ready to go again." "First of all, I need to give credit to Hearts. It's a thoroughly deserved win; they were the better team. "We didn't cope with their physicality, we made too many mistakes. "We could have played five games today and not scored a goal. "But I also want to congratulate my players. To have gone through 69 games and this to be their first defeat; of course it's a sore one when you are beaten like that but they can hold their heads up. "They have been absolutely amazing over those 18 months." BBC golf presenter Eilidh Barbour: "And it’s over! Celtic’s record breaking and quite superb domestic run comes to an end. Couldn’t see it coming ending quite so convincingly, but well done to the Jambos." Do we have a title race on our hands? Aberdeen are just two points behind the champions now. Brendan Rodgers' men play their game in hand on Wednesday, with bottom side Partick Thistle visiting Celtic Park. Hearts pressed so high up the pitch. It's what Celtic normally do to others. There were just too many errors from Celtic today, they couldn't string together four or five passes and Hearts got in about them and capitalised on those mistakes. Hearts stay fifth in the Premiership after a third consecutive win. The Jambos are now just three points behind Edinburgh rivals Hibernian, which adds some extra spice to the forthcoming derby at Tynecastle. Quote Message: Celtic are still odds on favourites to win the league but it will be interesting to see how they respond to this setback. It will give other teams hope. Celtic are still odds on favourites to win the league but it will be interesting to see how they respond to this setback. It will give other teams hope. As the Hearts players lap up applause from their ecstatic fans, Celtic assemble in an on-pitch huddle with manager Brendan Rodgers at the centre. What is his message? Maybe he'll tell us later? The Celtic run stops at 69. 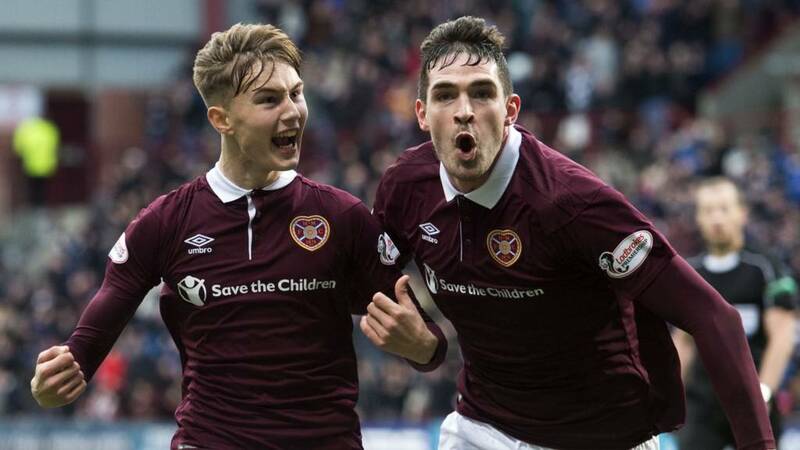 Hearts are in dreamland after a fantastic display against the champions. Scott Sinclair cuts inside his man and takes aim for the far corner, like he does so often, but Hearts are not giving Celtic an inch and a defender in maroon gets his tired body in the way.